I am a big fan of toys that get kids away from all things electronic and get them to work with their hands. For little kids, Lego is one of the most popular building games, but older children need a little more challenge to stay interested. 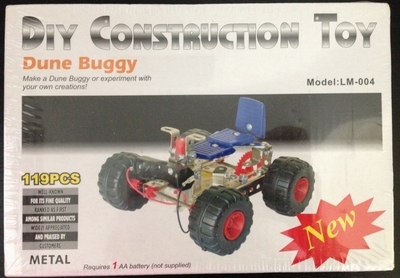 The DIY Dune Buggy is a metal construction toy with 119 pieces, which when completed runs on one AA battery. Not only do kids learn how to work with screw drivers, but also connect mechanical and electrical parts. The toy is suitable for children 9 age and up. As it contains small parts, it is a good idea to keep it away from their younger siblings. This toy is manufactured in China and is available for sale via several online stores.